Gentleman Jack - Download and Make! Gentleman Jack-Hammer has a hole to dig. Turn the handle to help him on his way. Print out the parts onto thin card. (230 micron / 67lb is about right) Notice that the first three sheets are printed double sided. Print out the page, flip it over and print out the other side on the back. Fold up the box top and base as shown, note that they are glued slightly differently. Fold and glue box sides making triangular tubes as shown. The cam is made from double thickness card. Fold it over and glue it down. Once the glue is dry carefully cut it out. Thread the cam onto the cam shaft and glue it into position. Roll round and glue the various axle tube as accurately as possible. Glue the two axle tubes into place using the grey lines for alignment. Glue the four parts of the box together. Use the picture to ensure that they are arranged in the correct order. Fold the box round and fit the cam shaft into place. Glue the handle to the cam shaft. Fold round and glue down the cam follower sides. Glue the cam follower end into place as shown. Glue on the push rod. Thread the push rod up through the hole in the box top. Glue the other end of the cam follower to the back of the box. Wrap and off-cut of paper round it and then glue it to the inside of the box. Fold found and glue the jack-hammer body. Glue in the support on the opposite side to the coin. Close up and glue the jack-hammer. Glue the grey area on the push rod to the support inside the jack-hammer. Roll round and glue the legs. Glue the shoes to the legs. Glue the two legs together. Glue the leg strap in place across the top of the legs. Curve round and glue down the jacket. 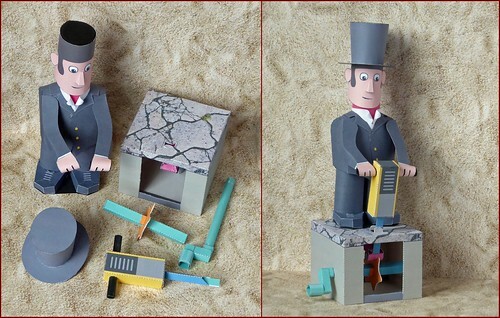 Glue together the top hat. Make sure you cut round the ears. Glue the nose to the grey area on the face. Fit the hat to the head. Score along the grey lines on the arms and crease them as shown. Roll round and glue the neck inner then glue the collar into place. Glue the back of the head to the top back of the neck. Glue in the two body sides. Trim away the excess from the bottom of the sides. Glue the collar to the body. Glue in the three tabs. Thread in the neck and glue it into place onto the three tabs. Glue the hands to the jack-hammer handle so that the creases in the arm are the same distance apart as the shoulders. Complete the model by gluing the arms to the body. Wonderful model, so realistic in function, also the vibration in the body. Two photos: with individual parts and assembled. The youtube link above is not correct!